How old is the company and what are you hoping to achieve with it? How do you use Social Media to grow your business? We mostly use Facebook, Linkedin and Twitter. Twitter plays an important role in our growth, we get more loyal readers and get more exposure as a brand. Twitter is very good for anyone who wants to be established as a brand. What advice to you want to give young entrepreneurs? The only advice we want to give to all the young entrepreneurs is that if you want to do something in life don’t take shortcuts, do the hard work and please be patient because success takes time. Trust yourself and your vision and do the hard work to achieve success. 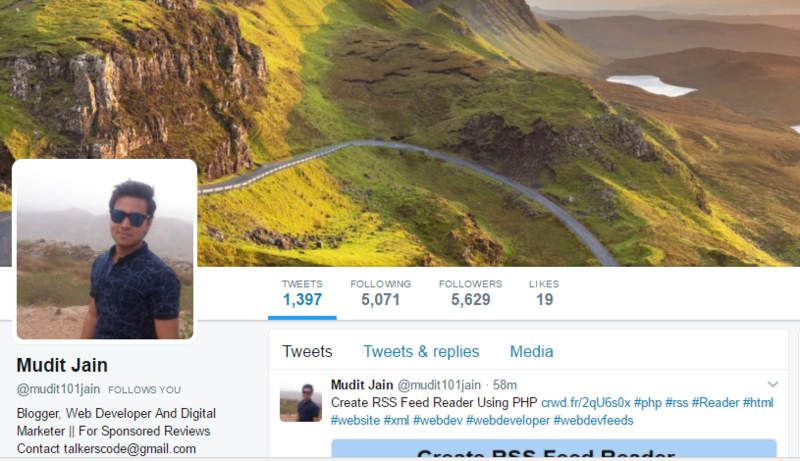 Mudit relies on Twitter heavily to find micro influencers that will be interested in having him review their product, like us. Then these brands share the reviews and their audiences go on his site and discover the free tutorials. So he is siphoning those audiences and offering them his content for free. It’s a win-win formula because the influencers get more recognition and he gets all the traffic. All of the TalkersCode tutorials are evergreen, meaning always relevant, because people will always want to learn coding and webdesign (until we have AI that does it all for us). It is also perfect for search engine optimization because it has a lot of keywords that people frequently search for. So every time he gets an outbound link on a microinfluencer’s site all of his content receives a higher ranking on google (as you outbound links number goes up every piece of content ranks higher). The best part about his site is that all of the tutorials are free. Just the fact that everything is free builds so much trust with his audience. Anybody from anywhere in the world can click on his site and learn something. So you automatically want to give back, learn more, participate. The tutorials are also really clear, easy to learn, and highly detailed. The combination of quality, relevant, and free content is the key to his success. Mudit Jain proves that if you have the grind then you will succeed. If you want to learn more about content marketing check out this article that the key metric that you need to follow. Ben Kazinik (@eclincherrocks) is an inbound marketer for eClincher, the world’s most powerful social media management platform. He enjoys hiking, cooking, soccer, and visiting his family around the world. Email me at – ben@eclincher.com ? Super post! I am glad for the actionable traffic generating idea. Keep writing & coding Mudit! Thank you eClincher! Great content is content that gives value to your both your visitors and your site. Content is worth nothing, if it you doesn’t convert any of the traffic. You need your visitors to engage with your site and your content in order to get any value from them. Ultimately, you’d like to convert all visitors into customers, but that’s not realistic. Why not try to convert them into email leads? Then you’ll have unlimited chances of converting them into customers later on with your email marketing.